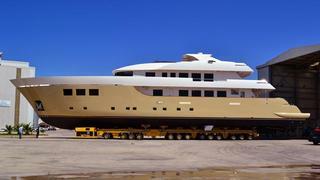 The Nedship yard in Antalya, Turkey launched the new 42m displacement motor yacht BaiaMare on Monday, July 11th. Ready to cruise this summer, she’s now for sale by the yard, asking €12.9 million. Key features include her build in epoxy composites with carbon reinforcements and she has a spacious layout for 12 guests with a master suite and VIP stateroom on the main deck plus four guest cabins on the lower deck. A tunnel propulsion system gives her hull better efficiency and lower draft with speeds expected to top 18 knots, while BaiaMare will cruise at 15 knots.